We have a collection of unusual stones, each with its own quality and purpose. Rose Quartz: Carries a gentle pink essence that speaks directly to the heart chakra, reawaking to its own innate love. 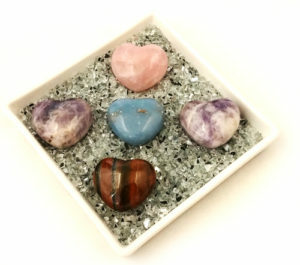 Helps dissolve emotional wounds, fears and resentment. Angelite: A lovely blue stone that is associated with the throat and crown chakra. It is used to bring serenity, inner peace and a sense of calm. It is excellent to overcome stress, anger or overwhelming situations. Tiger Eye: A lovely brown crystal with yellow-golden bands through it, bringing harmony, balance and releasing fear along with anxiety. Helps stimulate the base chakra, sacral chakra and the solar plexus chakra. Green Aventurine: Also known as the “stone of opportunity,” their green appearances of minerals help with the area of building self-confidence and in many areas of life or relationships. Amethyst: A purple meditative and calming stone which helps work emotional, spiritual and physical state to promote calm, balance and peace. Obsidian: An excellent aid that helps release negativity, it helps aid your ongoing physical, emotional and spiritual health. Onyx: A black radiant stone that helps release negative emotions like sorrow or grief. It is a protective stone that fortifies self-confidence and sharpens your senses. Carnelian: A bright-orange sunset stone can energize the physical body, and give you the vitality to take the actions you need to take. This stone belongs to the sacral chakra, helping in the reproductive areas of the body as well as stimulating sexual energy. Citrine: A very pale yellow that corresponds to the third eye chakra, this aids to think clearly. Citrine guides your level of mental clarity and accelerating spiritual visions.